In Hotel Planja**** you can spend great active holidays, quality time vacations, have business meetings or simply just relax and take a break from the hectic lifestyle. Beside the great hotel restaurant with self-service buffet, also the additional culinary offer is fantastic – on request the hotel chefs prepare delicious traditional dishes from Pohorje and amazing deserts for you. You will experience a very special atmosphere in the Stara koča, where you will be pampered with delicious cuisine and selected wines while sitting beside a cozy fireplace. For hosting seminars and workshops Hotel Planja Rogla has a spacious multipurpose hall, several smaller seminar rooms and a gallery. There is also a kid's corner, an info desk, an internet corner, an aperitif bar and a gift shop in the hotel. And with lifts you can easily get around the hotel. Guests visiting Rogla can relax in the modern wellness centre Dežela dobrega počutja with several saunas and an indoor swimming pool. A whirlpool and a children's pool are of course also there. Visit the wellness centre and enjoy in one of the several baths or massages, maybe also visit the modern medical centre with a pulmonology clinic which is also located in the hotel. The hotel complex also has a great sport hall (2.200 m2), where guests can play volleyball, tennis, table tennis, basketball, squash, go to the gym or try to climb on the artificial climbing wall. All the sport's equipment can be rented in the hotel sport's rental shop! 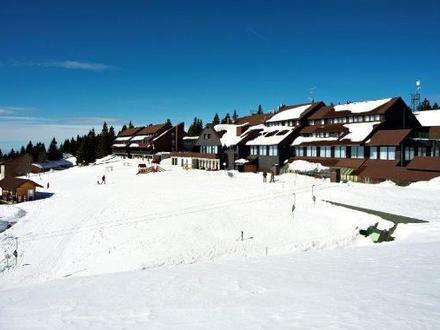 Hotel Planja Rogla. Hotel Rogla. Rooms Rogla.